I've developed a method of container gardening that works well on a brownstone rooftop. I mix lightweight growing media with lots of rich NYC Deptartment of Sanitation compost and various organic amendments. I use a drip irrigation system to water the containers, and tons of mulch to conserve moisture. I've selected chile varietals over the years that thrive on a rooftop. Various kinds of chiltepin are my specialty. This is a pepper that grows wild in the North American Southwest and is thought to be similar to the original chiles growing in South American thousands of years ago. 2008 has been an excellent year for the chile crop. My plants have produced abundantly and I'd like to share the harvest with other Brooklyn chile lovers. 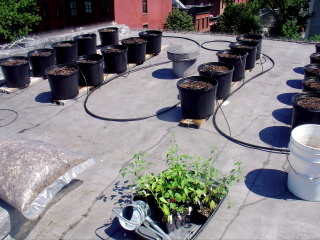 In the 2008 growing season I had about 30 chile plants on the roof, along with a couple tomatoes and melons for company. Of the chiles, I had a mix of several varieties of chiltepins accounting for 25 plants, and 5 de arbols. All did really well, and I only lost one to wind damage. Over the years I've experimented with a number of plants in roof gardens and many do well for a while. But the harsh conditions of super-wide temperature range, highs well above 100F for a good part of the summer, and deadliest of all - the wind. Most plants with large fruits have a tough time on the roof. Even staked really well, almost all tomatoes don't make it through August. Similar problem with larger peppers like anchos. So chiltepins are ideally suited to handle all of these conditions. The de arbols do really well too, though mine come out milder than most I've tasted elsewhere. The arbols have an additional problem of being tasty to squirrels. I played a game of chile chicken with the squirrels this year, trying to coax a few more days of sunlight only to have many fruits chomped on by critters. Thankfully the varmints don't seem to like chiltepins. As the nights got cool in October of 2008 I realized that the plants didn't have much more comfortable time on the roof, but many fruits were still immature as plants that had fruited early were still producing new fruit. I loved those plants too much to let them die in the frost. So I converted the guest room of my apartment into an indoor growing space and brought the plants indoors. It wasn't a pretty start. As I had read they would, the plants dropped most of their leaves. When they started growing back there was a massive aphid infestation. 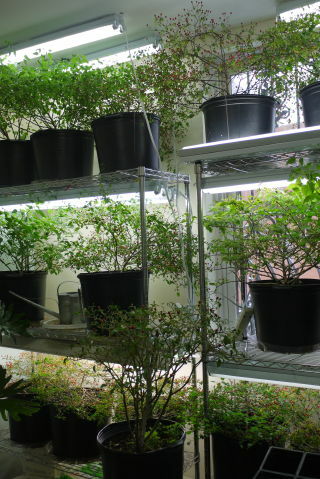 But I got rid of the aphids, and nestled under four-foot florescent shop lights supplemented by a south-facing window the plants recovered from the shock of the move. By just after Thanksgiving things were rocking in the "garden" and flowers started to form on several of the plants. 2009 was a crazy garden year. In the spring I was ambitious and started four different gardens including test satellite gardens in Fort Greene, Staten Island, and the East Village. Then my family needed to go to LA for the summer and I had to leave all of the gardens behind. I tried my best to consolodate the plants on to my roof and had about 80 plants up there in June. The main consequence of the trip was that I didn't fertilize at all in July and August and as a result the plants were very small when I returned. It was a bit of a pyschic blow. The second year plants seemed to do best and grew quite large and prolific. But somehow the whole year seemed like a dud. 2010 will be better. 2010 is starting off better. 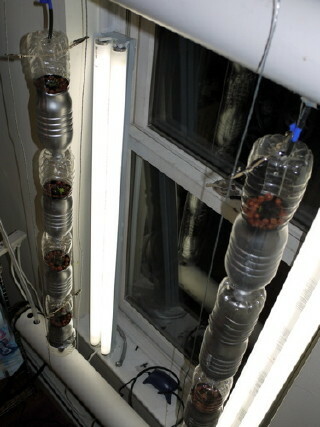 I built my first indoor hydroponic project using the windowfarms airlift design. I'm not using peppers in this one, but the project has gotten my excited about fusing my interests in gardening and technology. My plan for this outdoor gardening season is to not try to increase the size of my garden, but to really improve my understanding of the plants and what makes them produce the best. I'm starting with a whole new crop of plants and will try to program an Arduino to monitor garden conditions such as soil moisture, pH, temperatures and humidity, and possibly the appearance of the plants so that I can monitor gardens remotely. If it works well I hope to use web-enabled Arduino to control my drip irrigation and fertilizer systems. 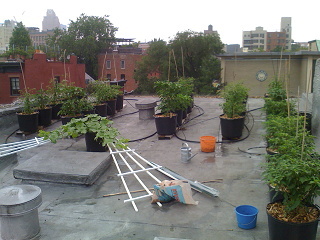 I would love to set up at least one satellite garden this year, hopefully on an industrial roof in Gowanus so that I can compare data from my home garden with a second site.